THE special theory of relativity is so well established by indirect evidence that the significance of the original aether-drift experiments has decreased, and the experimental discrepancies in the results obtained have caused few misgivings. Such discrepancies should, however, be examined if further developments in experimental technique enable new and possibly more precise methods to be employed. 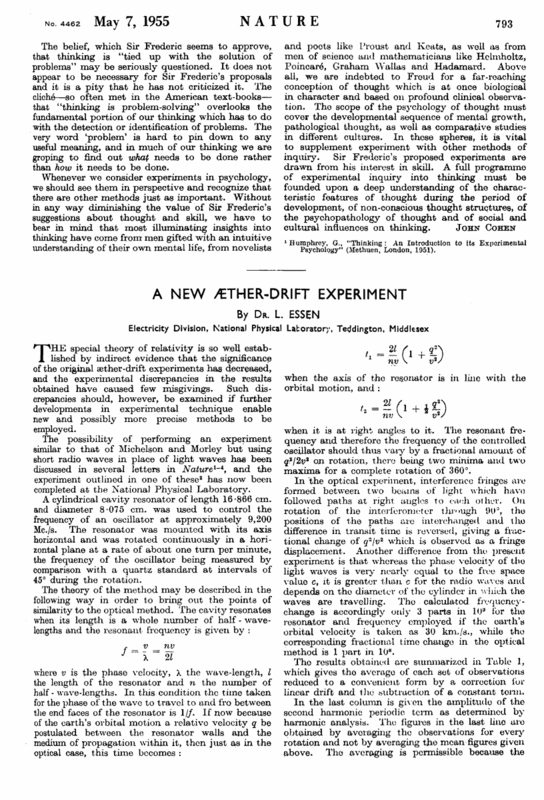 The possibility of performing an experiment similar to that of Michelson and Morley but using short radio waves in place of light waves has been discussed in several letters in Nature1-4, and the experiment outlined in one of these2 has now been completed at the National Physical Laboratory. A cylindrical cavity resonator of length 16.866 cm. and diameter 8.075 cm. was used to control the frequency of an oscillator at approximately 9,200 Mc./s. The resonator was mounted with its axis horizontal and was rotated continuously in a horizontal plane at a rate of about one turn per minute, the frequency of the oscillator being measured by comparison with a quartz standard at intervals of 45° during the rotation. when it is at right angles to it. The resonant frequency and therefore the frequency of the controlled oscillator should thus vary by a fractional amount of q2/2v2 on rotation, there being two minima and two maxima for a complete rotation of 360°. In the optical experiment, interference fringes are formed between two beams of light which have followed paths at right angles to each other. On rotation of the interferometer through 90°, the positions of the paths are interchanged and tho difference in transit time is reversed, giving a fractional change of q2/v2 which is observed as a fringe displacement. Another difference from the present experiment is that whereas the phase velocity of the light waves is very nearly equal to the free space value c, it is greater than c for tho radio waves and depends on the diameter of the cylinder in which the waves are travelling. The calculated frequency -change is accordingly only 3 parts in 109 for tho resonator and frequency employed if the earth’s orbital velocity is taken as 30 km./s., while the corresponding fractional time change in the optical method is 1 part in 108. 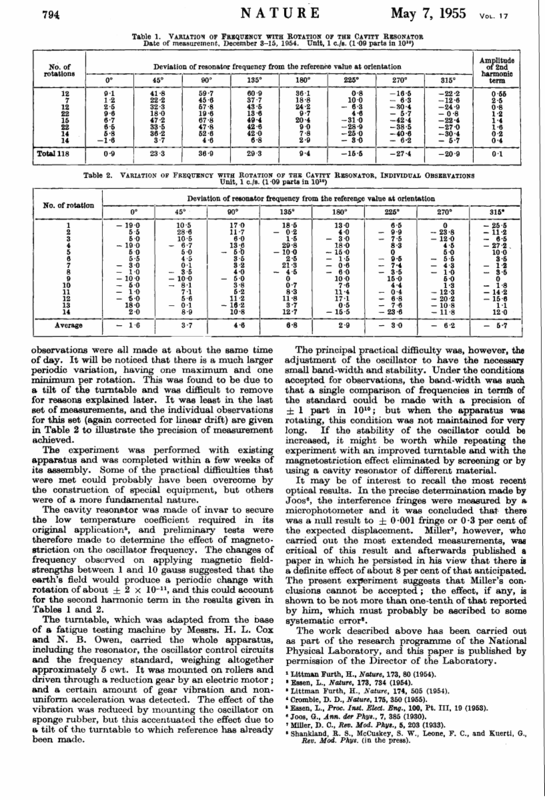 Tho results obtained are summarized in Table 1, which gives tho average of each set of observations reduced to a convenient form by a correction fur linear drift and the subtraction of a constant term. observations were all made at about the same time of day. It will be noticed that there is a much larger periodic variation, having one maximum and one minimum per rotation. This was found to be due to a tilt of the turntable and was difficult to remove for reasons explained later. It was least in the last set of measurements, and the individual observations for this set (again corrected for linear drift) are given in Table 2 to illustrate the precision of measurement achieved. The experiment was performed with existing apparatus and was completed within a few weeks of its assembly. Some of the practical difficulties that were met could probably have been overcome by the construction of special equipment, but others were of a more fundamental nature. The cavity resonator was made of invar to secure the low temperature coefficient required in its original application5, and preliminary tests were therefore made to determine the effect of magnetostriction on the oscillator frequency. The changes of frequency observed on applying magnetic field-strengths between 1 and 10 gauss suggested that the earth’s field would produce a periodic change with rotation of about ±2 × 10–11, and this could account for the second harmonic term in the results given in Tables 1 and 2. The turntable, which was adapted from the base of a fatigue testing machine by Messrs. H. L. Cox and N. B. Owen, carried the whole apparatus, including the resonator, the oscillator control circuits and the frequency standard, weighing altogether approximately 5 cwt. It was mounted on rollers and driven through a reduction gear by an electric motor; and a certain amount of gear vibration and non-uniform acceleration was detected. The effect of the vibration was reduced by mounting the oscillator on sponge rubber, but this accentuated the effect due to a tilt of the turntable to which reference has already been made. The principal practical difficulty was, however, the adjustment of the oscillator to have the necessary small band-width and stability. Under the conditions accepted for observations, the band-width was such that a single comparison of frequencies in terms of the standard could be made with a precision of ± 1 part in 1010; but when the apparatus was rotating, this condition was not maintained for very long. If the stability of the oscillator could be increased, it might be worth while repeating the experiment with an improved turntable and with the magnetostriction effect eliminated by screening or by using a cavity resonator of different material. It may be of interest to recall the most recent optical results. In the precise determination made by Joos6, the interference fringes were measured by ft microphotometer and it was concluded that there was a null result to ± 0.001 fringe or 0.3 per cent of the expected displacement. Miller7, however, who carried out the most extended measurements, was critical of this result and afterwards published a paper in which he persisted in his view that there is a definite effect of about 8 per cent of that anticipated. The present experiment suggests that Miller’s conclusions cannot be accepted; the effect, if any, is shown to be not more than one-tenth of that reported by him, which must probably be ascribed to some systematic error8. The work described above has been carried out as part of the research programme of the National Physical Laboratory, and this paper is published by permission of the Director of the Laboratory. 1 Littman Furth, H., Nature, 173, 80 (1954). 2 Essen, L., Nature, 173, 734 (1954). 3 Littman Furth, H., Nature, 174, 505 (1954). 4 Crombie, D. D., Nature, 175, 350 (1955). 5 Essen, L„ Proc. Inst. Elect. Eng., 100, Pt. III, 19 (1953). 6 Joos, G., Ann. der Phys., 7, 385 (1930). 7 Miller, D. C., Rev. Mod. Phys., 5, 203 (1933). Rev. Mod. Phys. (in the press).